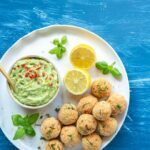 Easy-to-make baked salmon meatballs made with super simple ingredients and served with a spicy avocado dip! Awesomely dairy-free, gluten-free and ready in just 30 minutes. Perfect for dinner or as an appetizer! Preheat oven to 180ºC/350ºF. Line a baking sheet with parchment paper. Place the salmon in a large bowl and mash it lightly with a fork. Fold in the almond flour, lemon zest, basil leaves and garlic and give it a nice mix. Fold in the egg, and mix all the ingredients until well combined. If the mixture is a bit dry, add a splash of olive oil. If it’s too wet, add more almond flour. Season with sea salt and black pepper to taste. Use your hands or an ice-cream scoop to form even-sized meatballs, then arrange them on the prepared baking tray. Brush each meatball with olive oil and bake for about 10-12 minutes, until golden and cooked through. In the meantime prepare the avocado dip: place the avocado in a bowl and mash it well with a fork until creamy. Fold in the yogurt, lemon juice and zest, garlic and sea salt and black pepper to taste. Mix all the ingredients, then add as much chopped red chilli as you like. Remove the salmon meatballs from the oven and serve with the avocado dip on the side. *Before using the wild Pacific red canned salmon make sure to remove all the fishbones.